The 2018 Texas Grand Prix Series will pay out a total of $110,000! Join us May 19 at beautiful Texas Rose Horse Park for the first of three Texas Grand Prix events of our season. 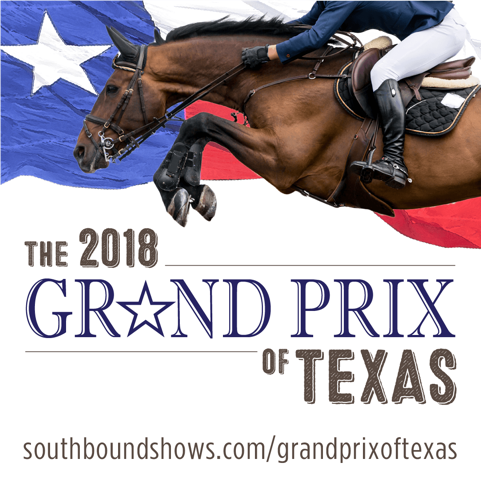 In conjunction with the Show Jumping Classic horse show, the Grand Prix of Tyler will offer $30,000 in prize money to exhibitors and serve as the first of three Grand Prix events to accumulate earnings toward Texas Grand Prix bonuses. Visit www.southboundshows.com for full details on this great show and $30,000 Grand Prix! Will Rogers Equestrian Center in Fort Worth, Texas will be the host of our $40,000 Grand Prix of Fort Worth, benefitting the Fort Worth Zoo. Scheduled for May 26 as part of the Southwest Classic Horse Show on May 26, this event is sure to please exhibitors and spectators alike! The mission of the Fort Worth Zoo is to strengthen the bond between humans and the environment by promoting responsible stewardship of wildlife and ensuring diverse, high-quality educational and entertaining family experiences through effective and efficient management of its resources. Memorial Day will set the perfect stage at Dallas Equestrian Center at 4 pm for our $30,000 Grand Prix of Dallas, benefitting City House. The mission of City House is to provide emergency shelter, transitional residential living programs and outreach services to at-risk children and young adults who are in need due to abuse, neglect or homelessness, in North Texas.